With 180 speakers over the two days highlighted with Casey Neistat on the first day the event, was abuzz with excitement! After grabbing a quick coffee I reviewed the Dublin Tech Summit’s event app and decided to try and get the best possible seat and best possible view for each of the talks which interested me. 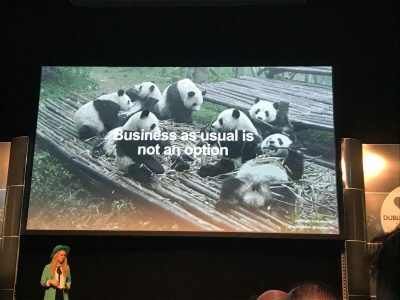 I found myself leaning towards INNOVATION and the highlight talk of the morning for me was “Avoid your Kodak Moment – How to Setup for Continuous Innovation” by Sofie Lindblom, CEO of ideation360. I found Sophie’s talk so engaging. She began talking about how being innovative is so important to her as it makes things happen, her love of how to find new ways to do things within technology, her love of wearing hats (she wore a big green one today) and she even shared with us her love of pandas, just to show she does have other interests outside of technology. Her main message was that if an idea is to progress you need to have an innovation system in place. One key thing that stuck with me was when Sofie talked about inspiration and acting on that inspiration, especially in technology and to use the “Yes and…” principle. Rather than say “No” to an idea, say instead “Yes and…” as it could make all the difference and give the opportunity to relook at something or try something you wouldn’t have considered before. So by saying “Yes and we will look at this…” or “Yes and we have thought about this before…” and from there, an idea, especially in technology, could become a reality. I took the opportunity to visit the Exhibition Hall, which had the Start-Up Pitch, this was really interesting with so many different early start-ups and growth stage start-ups businesses, with some very inspiring stories. With lots of showcasing and networking which is great for start-ups. I am sure there were quite a few investors in the room and it’s exciting to think that at Dublin Tech Summit 2018 there could be the next big thing in tech in the Exhibition Hall! Before I knew it Casey Neistat’s time on stage had come around. Casey Neistat was the one speaker I did not want to miss. His talk was titled “How To Be Heard”. Casey Neistat arrived on stage and the whole room was electric! I was swept away with the atmosphere and wanted to catch the moment. So I decided to do a Facebook Live and record his story, so I could share the experience and maybe inspire more people to hear what Casey had to say. He began with how as middle child he was never heard, he found it difficult to find his path in life and then video saved him. By creating videos and using this technology he became inspired and innovated himself to get himself heard. He took chances and some paid off and didn’t. Technology made all the difference for him. Casey’s relaxed and upbeat attitude to inspire future tech entrepreneurs was really engaging. Glad I recorded his talk and will refer back to it from time to time! 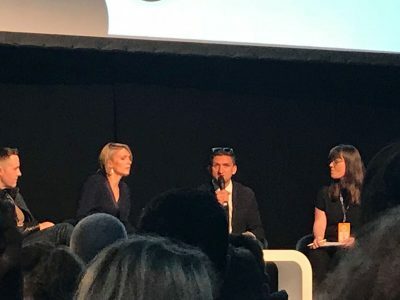 Regarding Day 1 of Dublin Tech Summit I got see and hear some really interesting speakers and panel talks from each of the four themes of the summit, but the two highlights of the day for me were the talks by Sofie Lindblom and Casey Neistat. I left at the end of Day 1 with such inspiration, could see how by being innovative amazing things can happen and was more than ever really looking forward to seeing what Day 2 of The Dublin Tech Summit had to offer! Day 2! 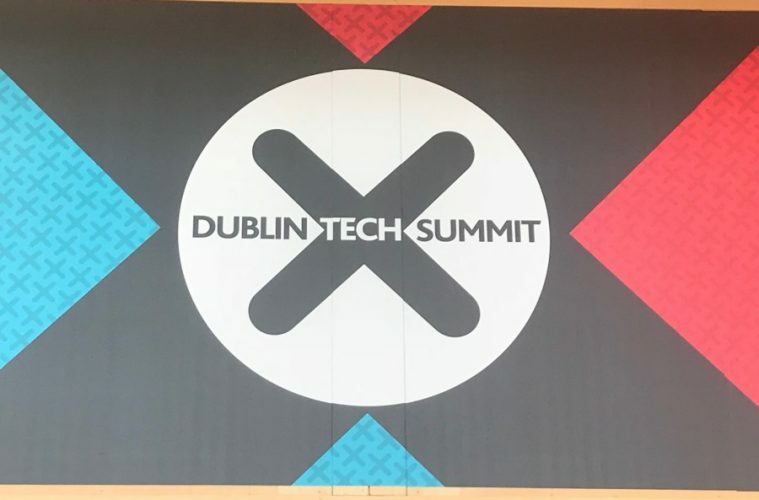 Another even sunnier and more spring-like day than the day before, I arrived at The Dublin Tech Summit #DTS18 in The Convention Centre Dublin. Eager to attend more talks and hopefully grab a selfie or two with some of the speakers! 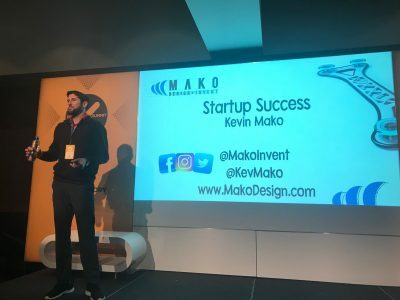 This time I made a beeline to watch Kevin Mako – CEO of Mako Design. He gave his talk under the theme TECHxFACTORY. The title of his talk was “Crucial Steps to Startup Success”. Kevin Mako is the Founder of the international consumer product development firm MAKO Invent. Kevin incorporated MAKO Invent in his third year at the Richard Ivey School of Business at just 22 years old, growing it to become the largest consumer industrial design firm in Canada. For his industry impact, outstanding leadership and rapid business development, MAKO Invent was named one of the best companies in 2016 by Entrepreneur Magazine. Kevin is also the Founder of the Generation Fund, a registered charity focused on funding university placements for top high school students in financial need. A lasting thought from his talk was to keep up to date with the knowledge of the tools you need such as various software, read about YOU and make small sacrifices for big gains such as don’t waste time. After his talk I got the opportunity to make his acquaintance and he was warm and easy to speak with. And he even took a selfie with me! I am not sharing the photo, as keeping that one for myselfie! Pamela Newenham is the co-founder and co-CEO of GirlCrew, a social networking app for women to make new friends. Previously a business journalist with The Irish Times, specialising in technology, start-ups, entrepreneurship and business. Pamela was named Technology Reporter of the Year 2014 in Ireland. She was editor of Silicon Docks: The Rise of Dublin as a Global Tech Hub, published in 2015. At university, she founded Ireland’s first student television station which is still running to this day. I knew about GirlCrew and I wanted to hear Pamela’s story of moving forward as an entrepreneur. This talk was really interesting with Pamela giving an overview of how she started and what she found along with way and she shared with the audience what good mentorship look like. Pamela gave examples of how even the most successful entrepreneurs in the technology world have mentors (such as Bill Gates) and her key tip for finding a good mentor was, to find a mentor who is six to twelve months ahead of you, not 10 years. The mentor who is six to twelve months ahead will “freshly” remember what you are going through. 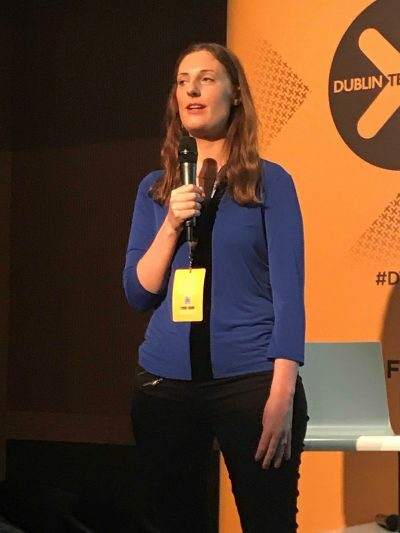 Pamela had great advice as in, where to find mentors formally (The Enterprise Board, LEOs and Prosper) and informally (networking like at The Dublin Tech Summit, through work and even friends). She preferred the informal route. Top tip was to have specific issues and ask for help in those areas and don’t forget to check if they have time as they could be mentoring others. And if possible meet for a coffee with your mentor as that keeps the timeframe and show you have focus and don’t want to waste your mentor’s time or yours. This talk caught my eye on the schedule, because of the positive message that Izzy Wheels put out “If you can’t stand up, stand out” and how her college project made a big difference to her sister Izzy, which the company is named after. Ailbhe’s sister, Izzy, uses a wheelchair and had wheel covers (which protect her hands from the wheel spokes), these are placed on the outside of the wheels of wheelchairs. Ailbhe and Izzy both felt the covers were not very exciting and could become very tired looking, even if you put stickers on them the stickers after a while would either look awful after getting wet or peel off. Ailbhe had a college project to do and came up with idea of interchangeable wheel covers for wheelchairs. 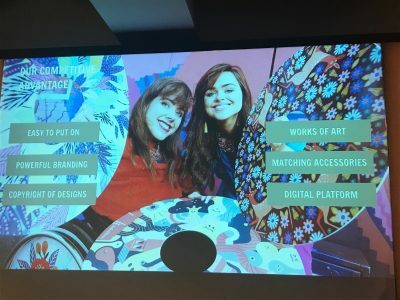 Ailbhe wanted to design covers which could be customised with different designs, weather-proof, light-weight and easily changed for the wheelchair user and so Izzy Wheels was born. Ailbhe shared with us how she went through lots of “ups and downs” in trying to find what would work and what would not work, with various prototype ideas and kept going until she found the right materials, design style and that they were easy to put on and take off. So now anyone who has a wheelchair can feel they can choose covers to suit them and even though they can’t stand up, they can stand out! Day 2 came to a close and overall The Dublin Tech Summit 2018, was so well worth a visit. I attended various talks and panel discussions, met lots of interesting people and learnt how inspiration and innovation can help an entrepreneur or budding entrepreneur turn an idea into a reality, especially in the world of technology. I highly recommend if you didn’t make it to this year’s event, to mark it in your diary for next year. It’s amazing what can happen in a year in tech and I for one will definitely be attending #DTS19. Just have to wait another 365 days though. See you there next year!